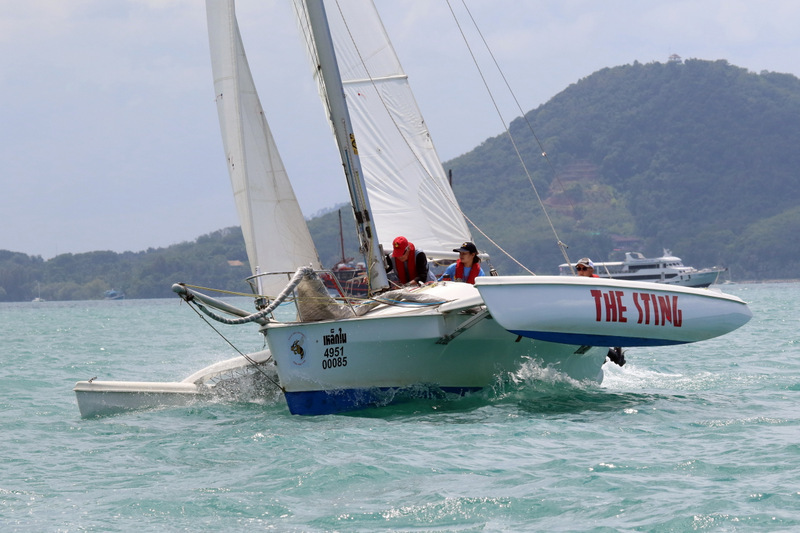 PHUKET: Day one in the 10th Multihull Solutions Regatta saw 15 boats divided into four classes compete off the shores of host organiser Phuket Yacht Club in Chalong Bay in the Boat Lagoon Race Day. 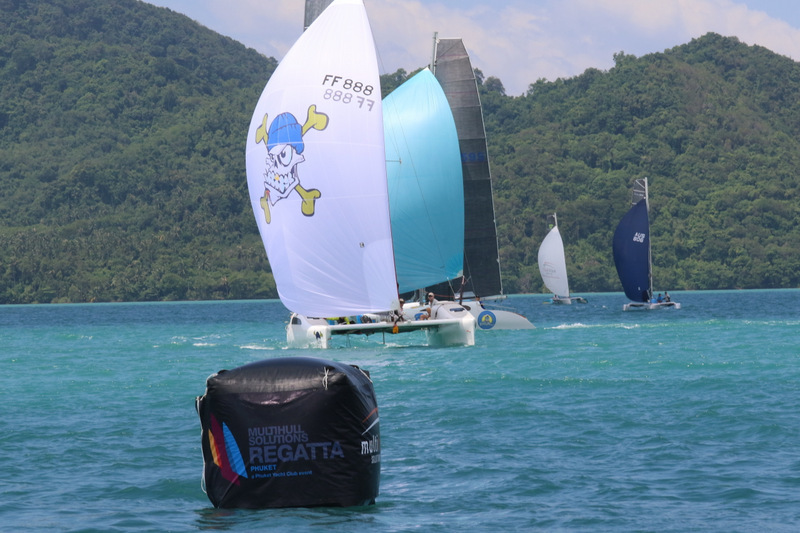 Before the regatta started, Multihull Solutions’ Andrew de Bruin said, “We are back for the 5th year as title sponsors to the Phuket Yacht Club’s Multihull Regatta and, as usual, we look to be in for the windiest and friendliest regatta in the region. Principal Race Officer Simon James ran windward-leewards for most classes for the first two races but sent the Cruising Class off a trip around Koh Lone for their second race of the day; the racing multis, including the Pulses, plus the Fireflies headed out and around the Cape Panwa safe water mark for their third and final race of the day. 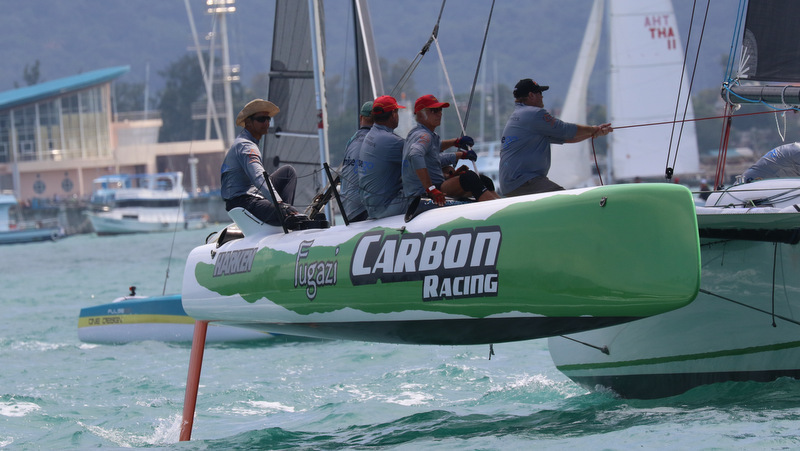 Dan Fidock’s trimaran Fugazi (formerly Three Itch) jumped off the start line and never let up as its main hull spent most of the day kissing the water’s surface as it cruised to line honours in each race. Bob Garner’s Blade Runner with two second places and a third, held on to second spot overall in Racing Multihulls with seven points after three races while Peter Wilcox’s Cosmo was in third spot with eight points. 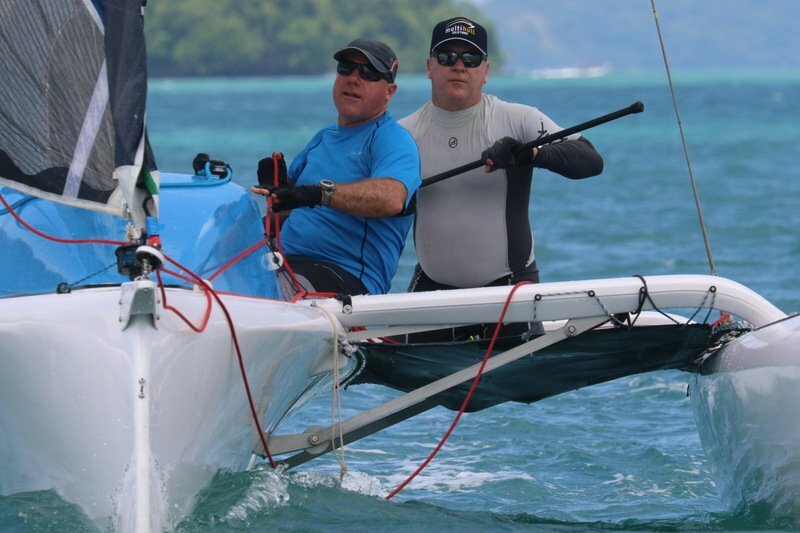 Mick Tilden’s 4-4-5 placings gave him fourth overall with 13 points, while Glywn Rowlands 6-5-4 finishes and 15 points gave Twister 2 fifth overall and Andrew de Bruin’s Multihull Solutions H30 finished sixth with his 5-6-6 placings and 17 points. They come in all shapes and sizes in this year’s Racing Multihull division ranging from Andrew de Bruin’s and Mick Tilden’s Pulse 600s to Peter Wilcox’s recently launched 12-metre foiling-assisted Stealth Cosmo to Bob Garner’s DM24 Blade Runner, Glywn Rowlands Stealth Twister 2, and Dan Fidock’s, Fugazi, built by Dan Moore, which always draws plenty of attention. Cosmo, built by Asia Catamarans, has been in the water for less than two weeks, and suffered through a 40-knot bashing on a recent trip to Langkawi. 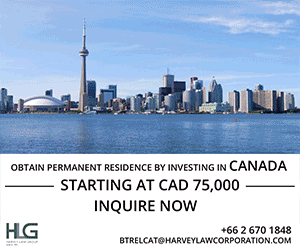 There are only two Stealths in this race, but much Stealth news as Hurricane was recently sold to a fellow in San Diego and was being shipped there by Sevenstar via New York. And past Multihull Solutions competitors Top Cat and Gale Force have both been re-sold, so lots of movement for Alan Cawardine’s creations. In the Firefly division, John Newnham’s Twin Sharks renewed its heated rivalry with Hans Rahmann’s Voodoo and race one saw the familiar Twin Sharks-Voodoo one-two finish. Twin Sharks continued to shine throughout the day capturing all three races while Voodoo faltered slightly earning 2-4-6 finished for third overall. George Eddings Blue Noze had a great day finishing 3-2-2 to hold on to second spot. Neil Ayre/Mick Coleman’s recently purchased Advanced CAE (Mamba) and their 4-6-3 finishes were good enough for fourth place. Ray Waldron’s Surf Patrol with a revamped crew was back to avenge its nose dive and capsize of last year and finished 6-3-4 on the day to hold down fifth spot. Jonathon Kingdon’s Moto Inzi took three fifth-place finishes to hold down sixth. 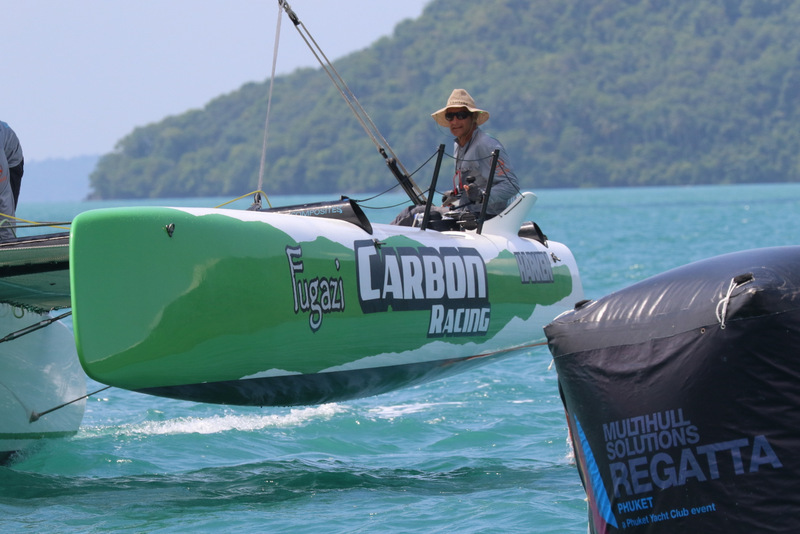 The Fireflys were designed by Phuketian Mark Pescott, who is racing on Surf Patrol for this regatta. Mick Tilden’s Pixalux and lead sponsor Andrew de Bruin with his Multihull Solutions H30 did battle in the two-boat Pulse 600 division. Tilden, who used to own a share in Fujin, put his competitive monohull racing career on hold when he discovered the joys of sailing a Corsair Pulse 600. Today’s racing saw Mick take all three races with Andrew coming a close second. The Cruising Multihull three-boat class saw Anthony Passmore’s DaVinci, Bill Kane’s The Sting and Rick Fielding’s Mojo finished 1-2-3 in the two races they sailed. The Multihull Solutions regatta draws a veritable who’s who of sailing in Phuket, as everyone who is anyone is involved in the regatta in some way. 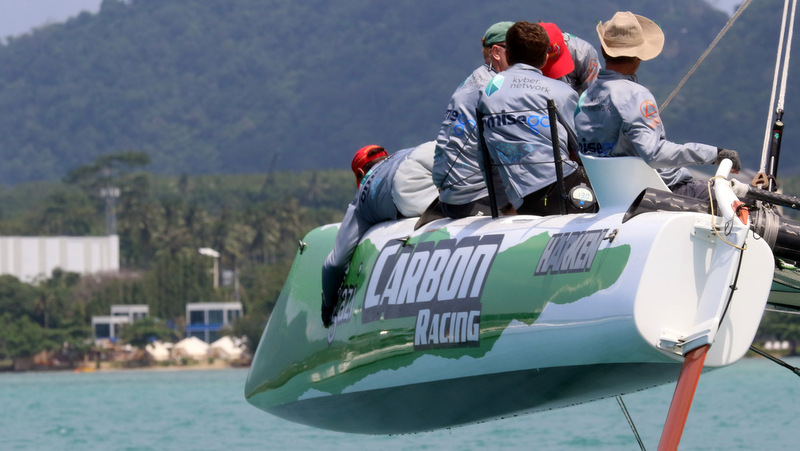 Racing on and around Chalong Bay continues today and tomorrow.